Our friends at United Cutlery have two brand new items that are now available to order through BUDK. The first item is the Helm of Sauron. This replica is created out of polystone then finished to match the prop we saw on screen during The Lord of the Rings, and the base that this helm sets on has been created from wood then made to look like the upper torso of Sauron. The helm can also be worn due to the padding on the inside of the replica. This piece will have an edition size of 1500 pieces world wide, comes with a price tag of $350, and will be shipping in July of 2013. If you’re a fan of Gondor then this next item is for you! During The Battle of the Last Alliance this shield was carried by soldiers of Gondor as they fought Sauron for the fate of Middle-earth. This amazing replica from United Cutlery captures the fantastic design we saw during the prologue sequence of The Fellowship of the Ring. 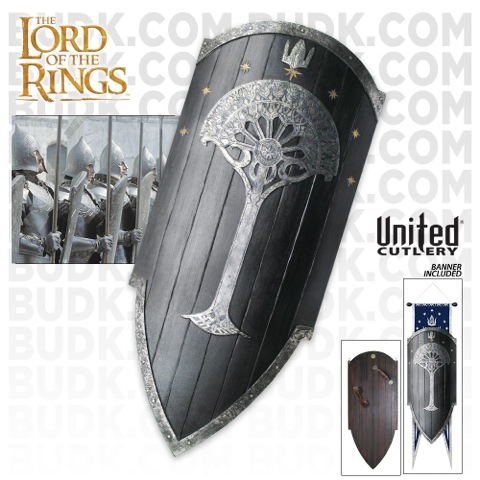 This fantastic item measures 42 1/2″ x 20 1/2 and comes with a awesome Gondorian Banner. You can pre-order this item right now for $250 and it also shipping in July of this year.